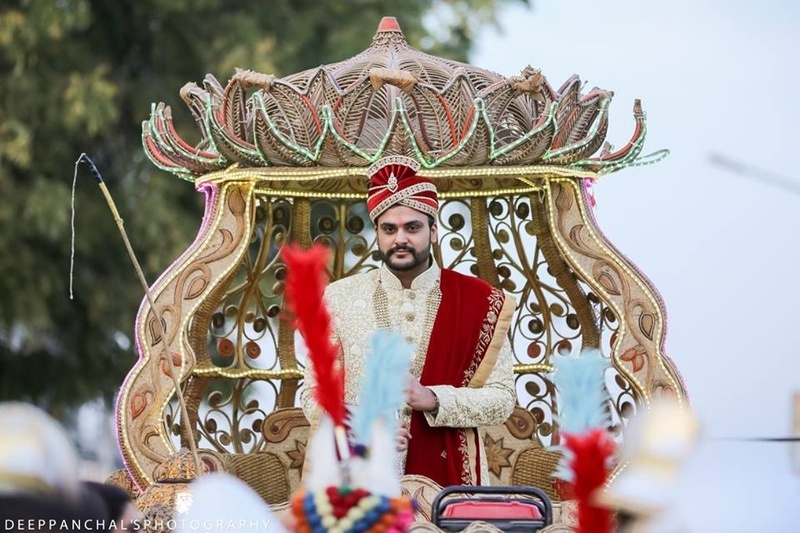 This wedding was truly a lavish and elaborate affair. 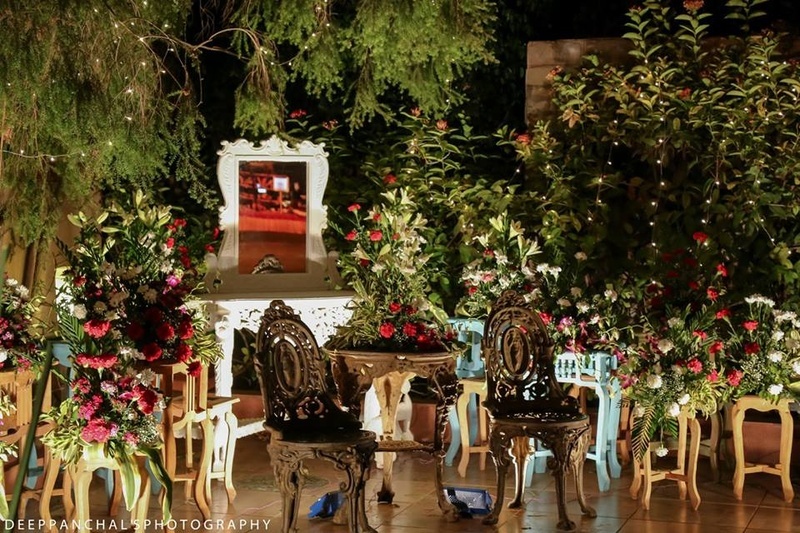 Ridhi and Rahul's wedding at Baghban Party Plot, Ahmedabad, was truly a lavish and elaborate affair. 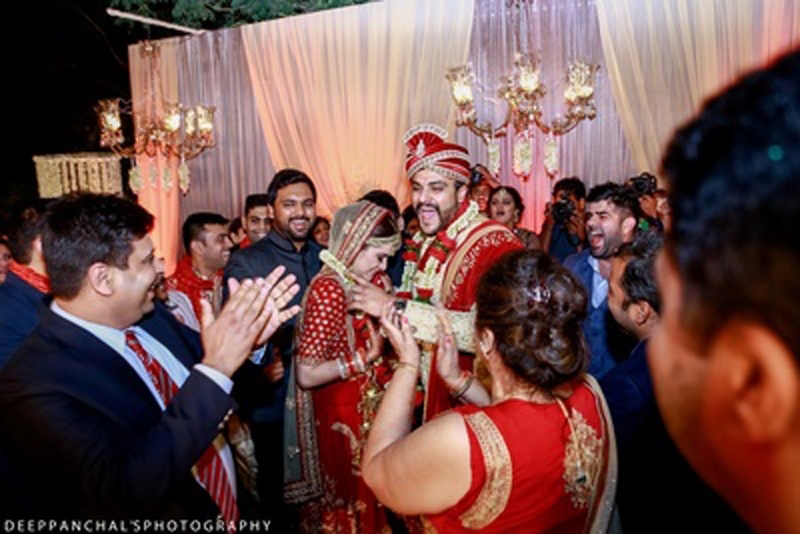 Amongst all the wedding naach-gaana, it comprised of happy highs and tearful lows that will be remembered forever. 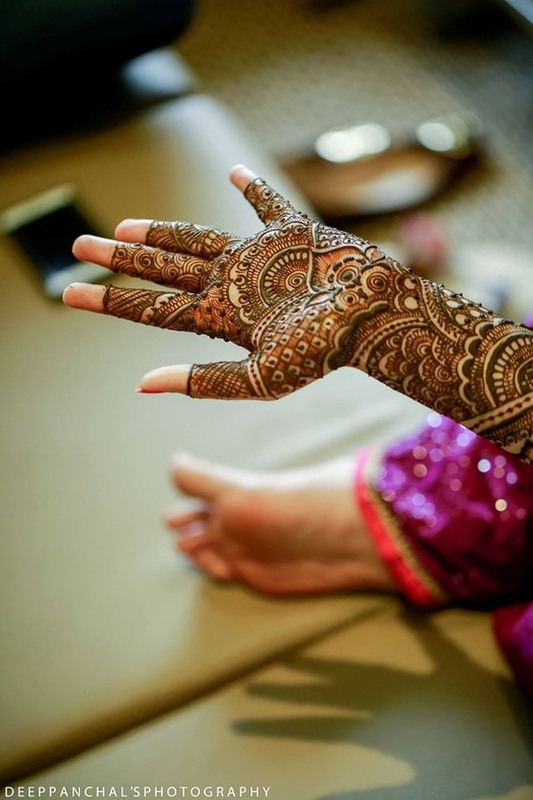 Look out for Ridhi's contemporary mehndi, especially the minimalistic feet designs. 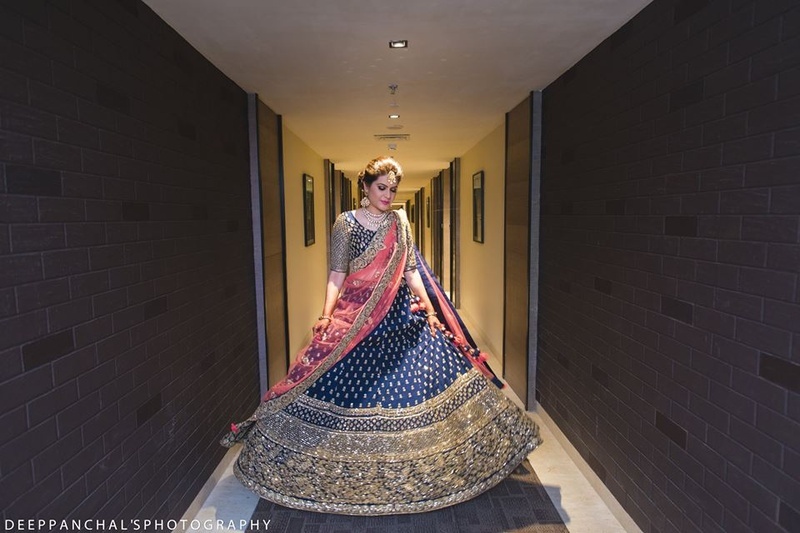 What stole the show was her gorgeous blue and gold lehenga with a peach dupatta. 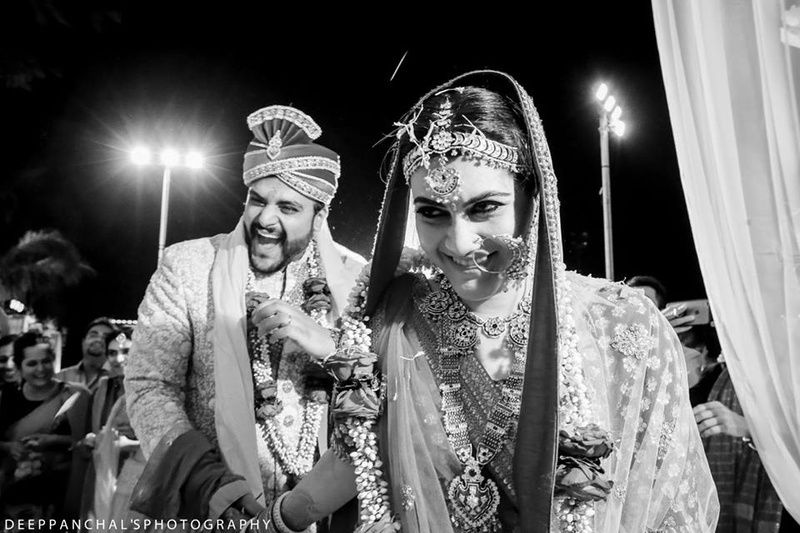 Captured brilliantly by Deep Panchal's Photography! 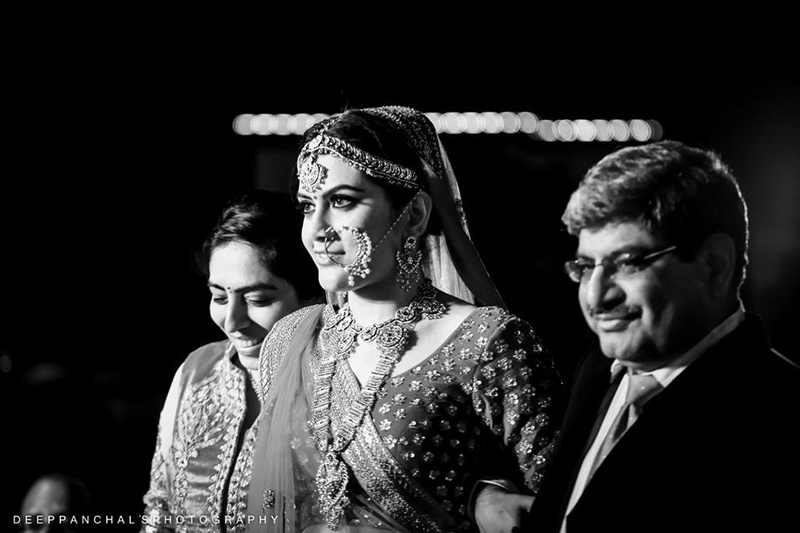 RIDDHI + RAHUL Wedding Highlight from Deep panchal's Photography on Vimeo. 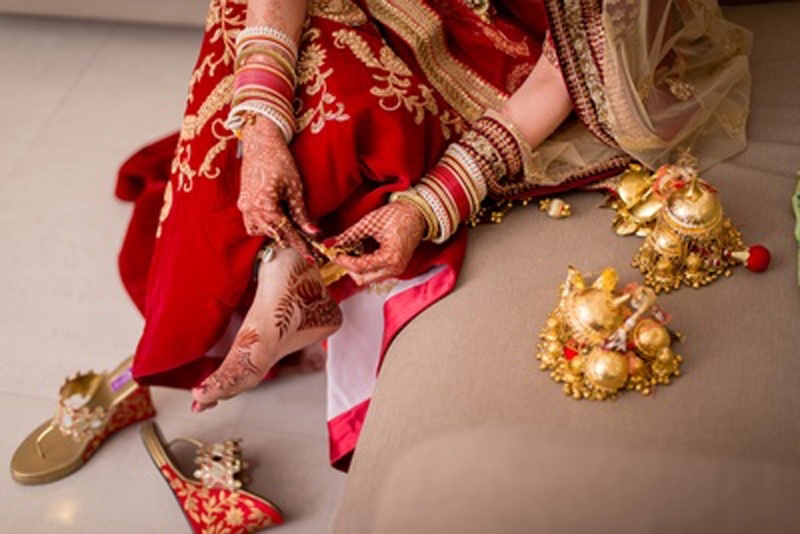 Bridal mehendi designs on feet. 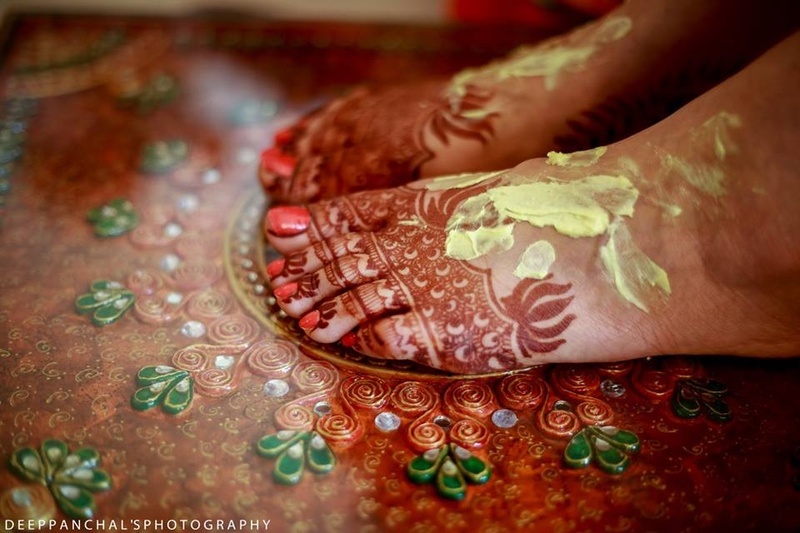 Haldi paste on feet filled with stylish mehendi design. 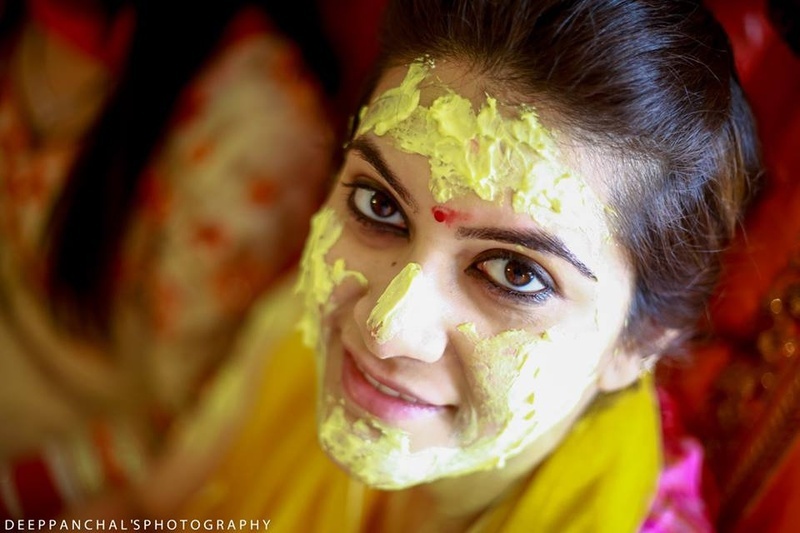 Riddhi drenched in Haldi paste for the haldi ceremony. 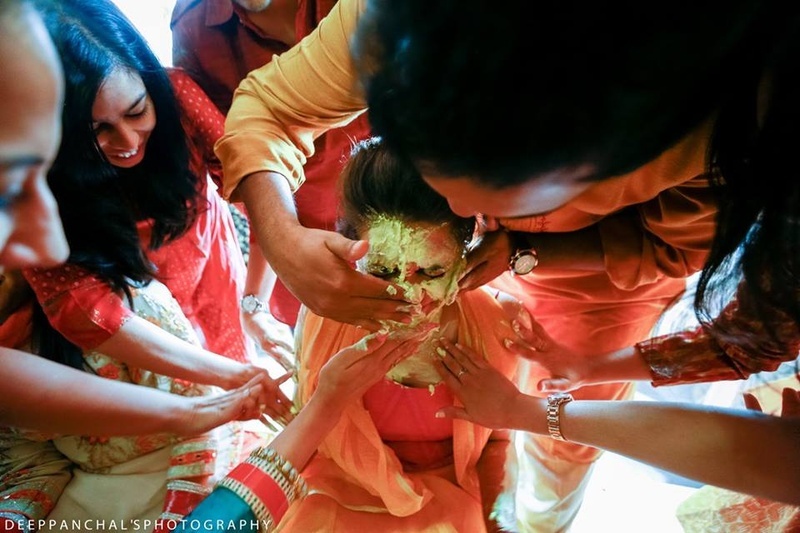 Haldi ceremony photography by Deep Panchal. 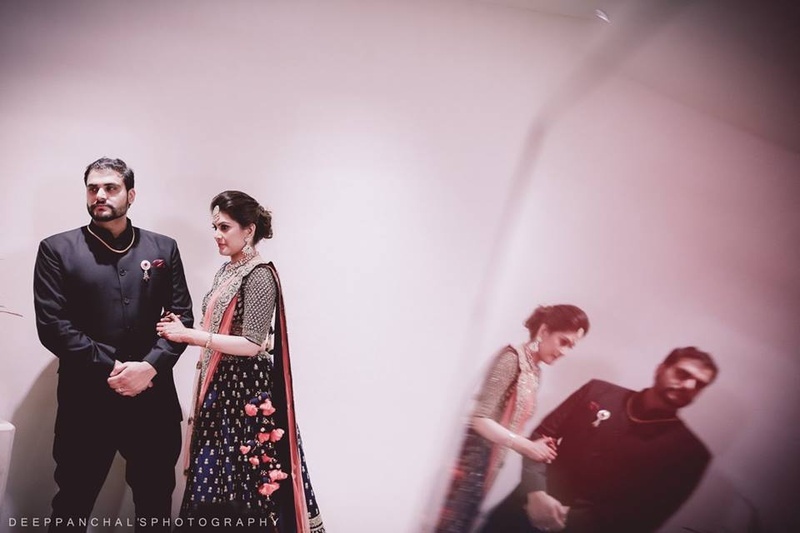 Riddhi and Rahul looking stunning with their color coordinated outfits for the sangeet ceremony. 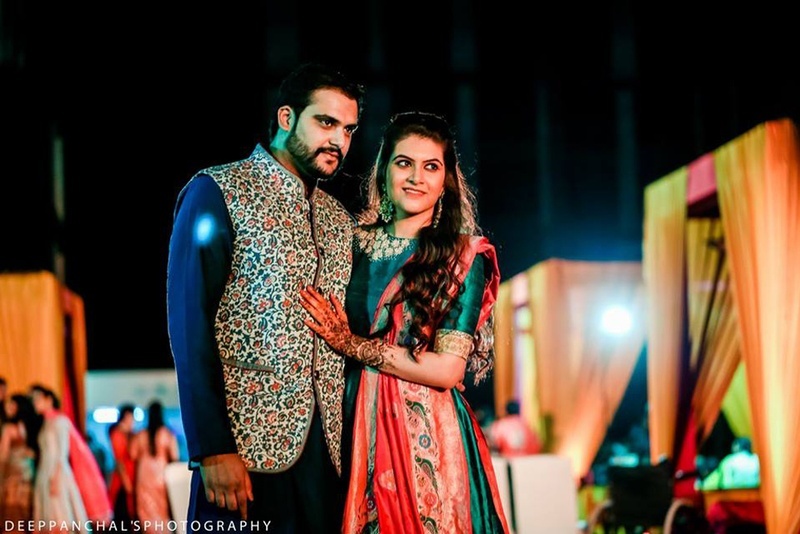 Rahul wearing dark green silk kurta and pajama with floral printed nehru jacket. 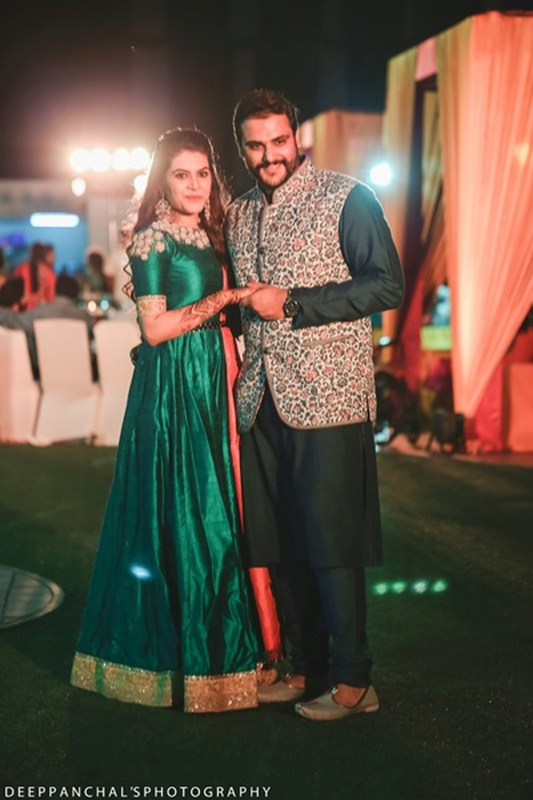 Riddhi wearing olive green anarkali paired with orange dupatta. 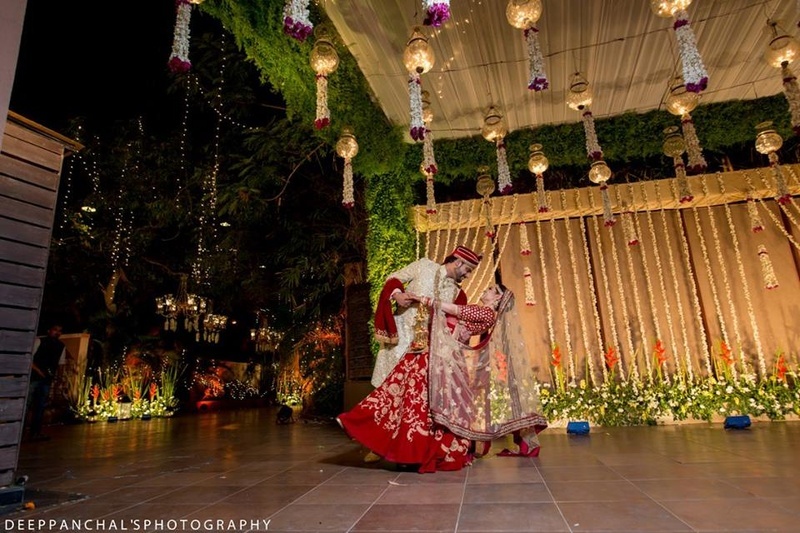 Wearing color coordinated outfits for the Engagement ceremony. 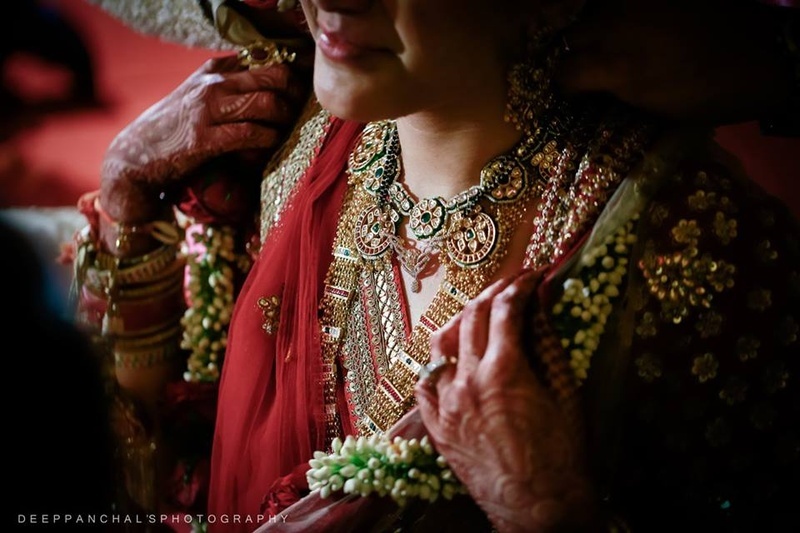 Adorned in beautiful polki passa and bridal jewellery for the engagement ceremony. 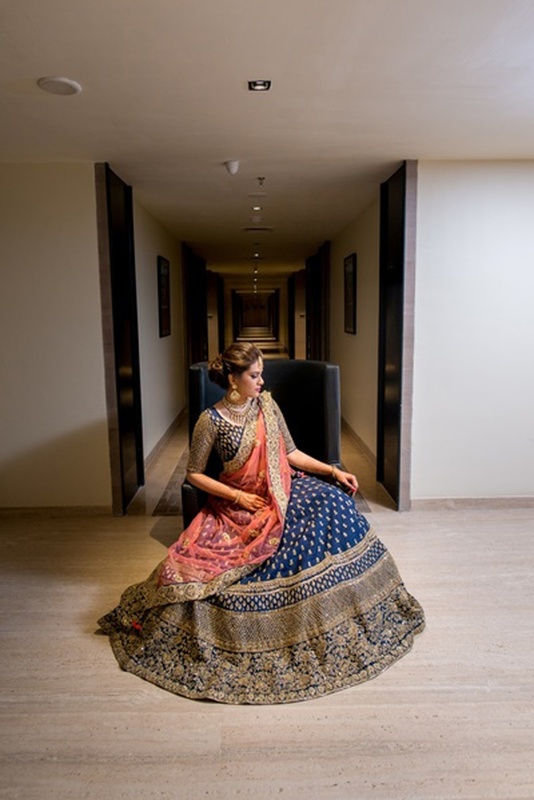 Wearing royal blue lehenga with heavy gold work paired with peach dupatta for the engagement ceremony. 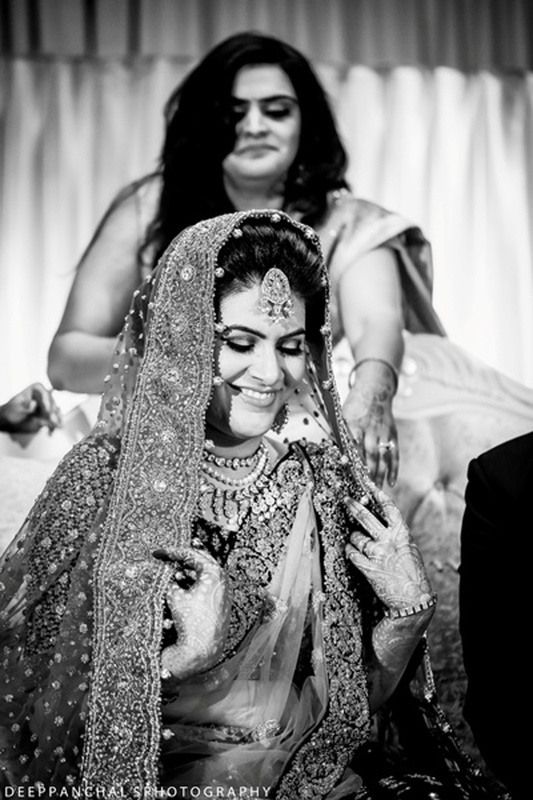 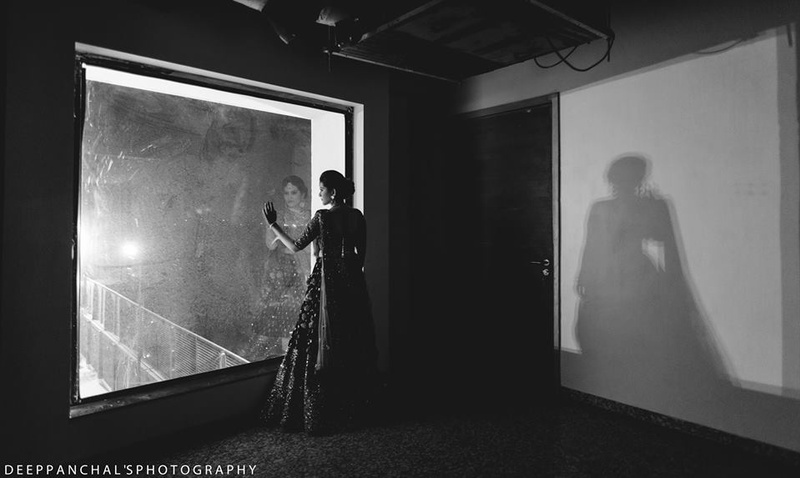 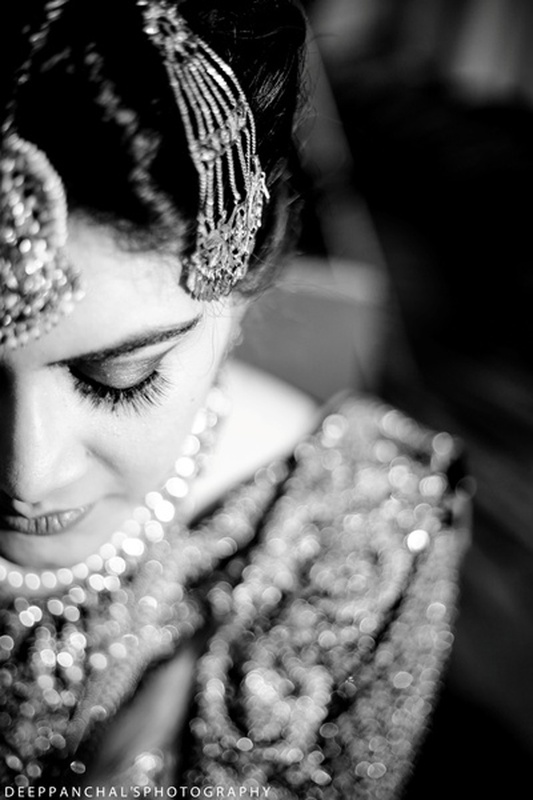 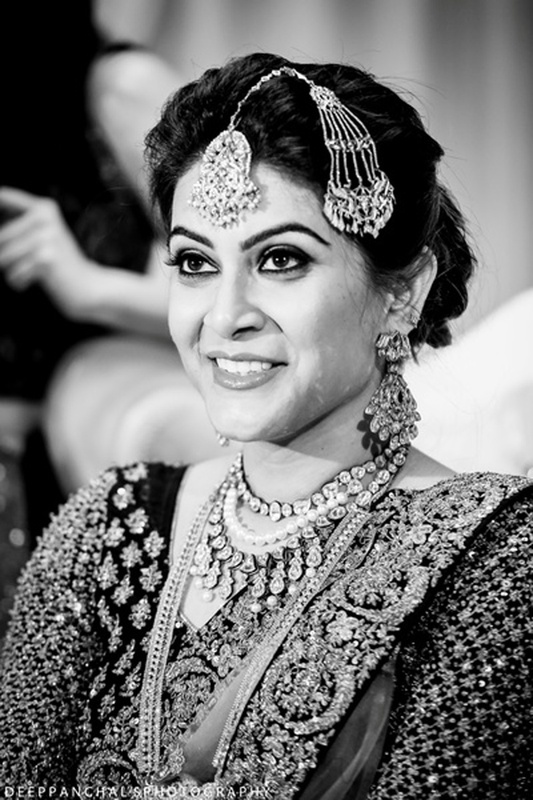 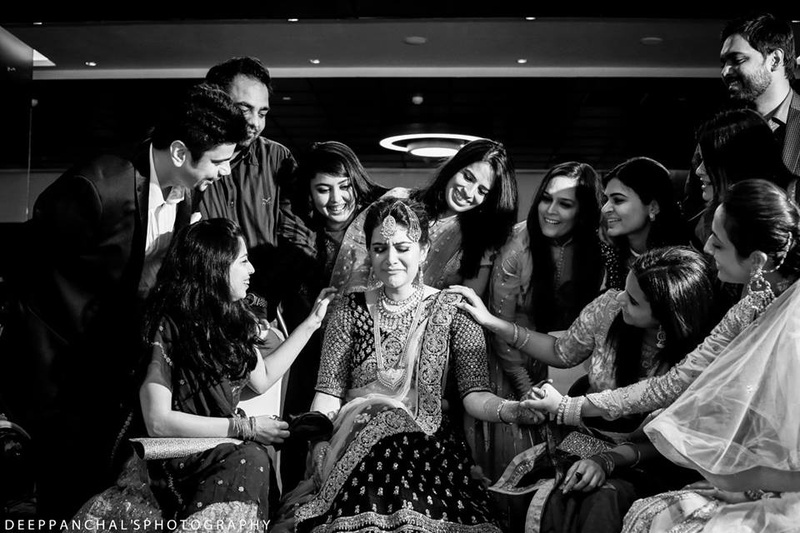 Black and white candid bridal photography by Deep Panchal's photography. 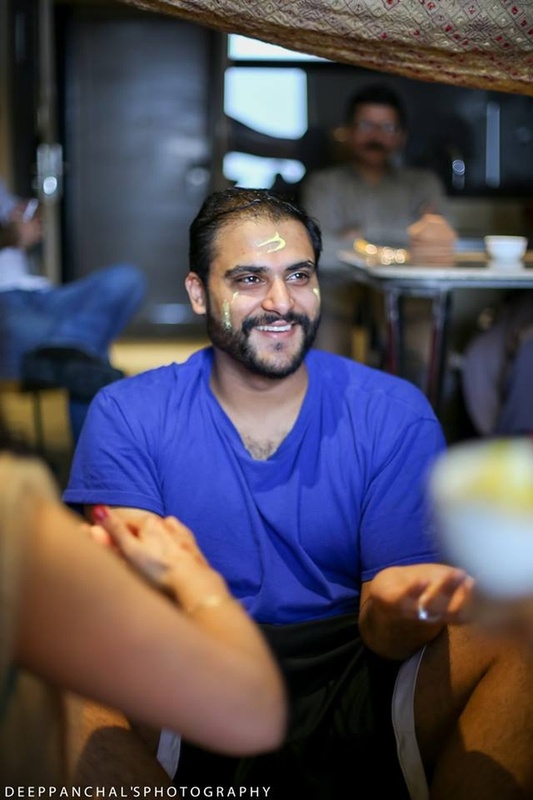 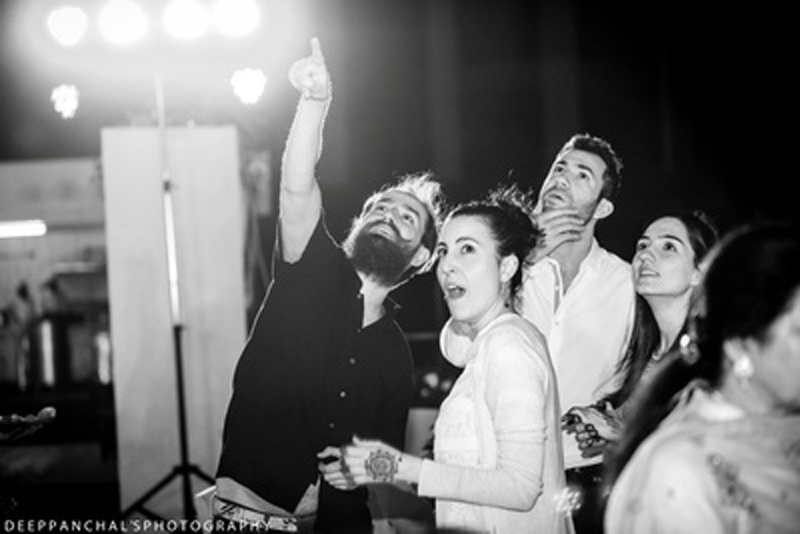 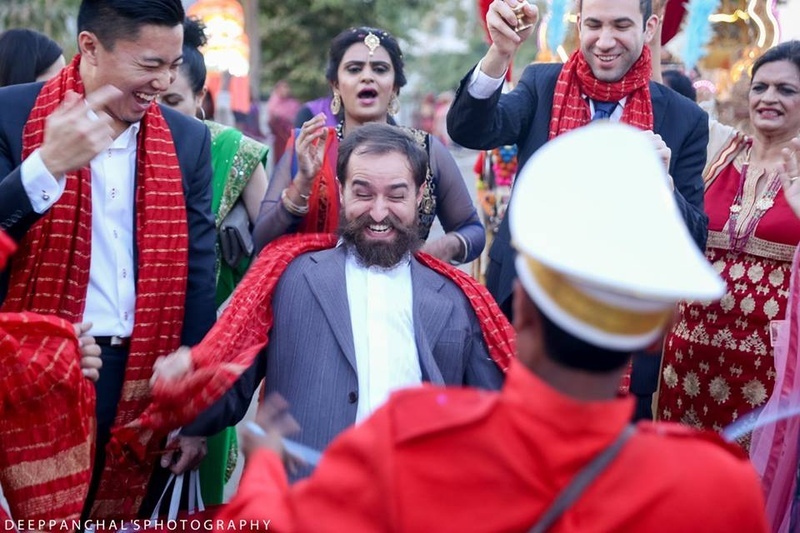 Fun wedding moments captured by Deep Panchal's Photography. 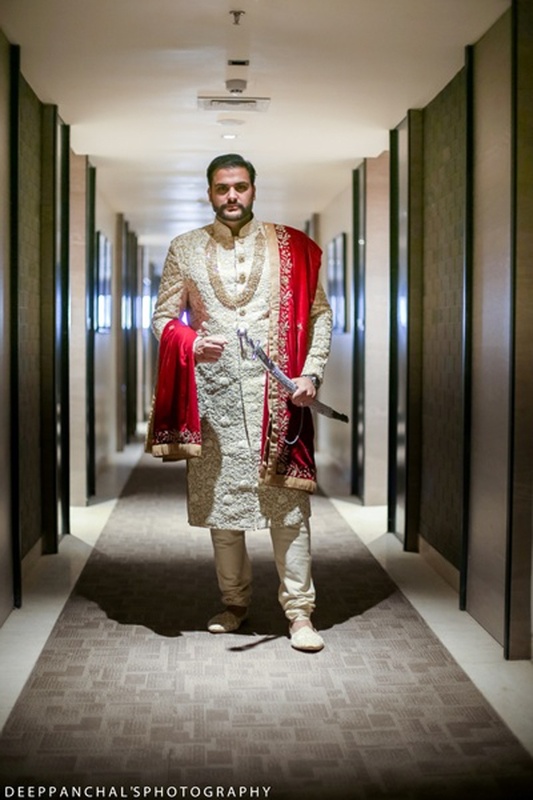 Wearing off white sherwani with embossed work details paired with red dupatta and styled with white and gold multi stringed neck piece. 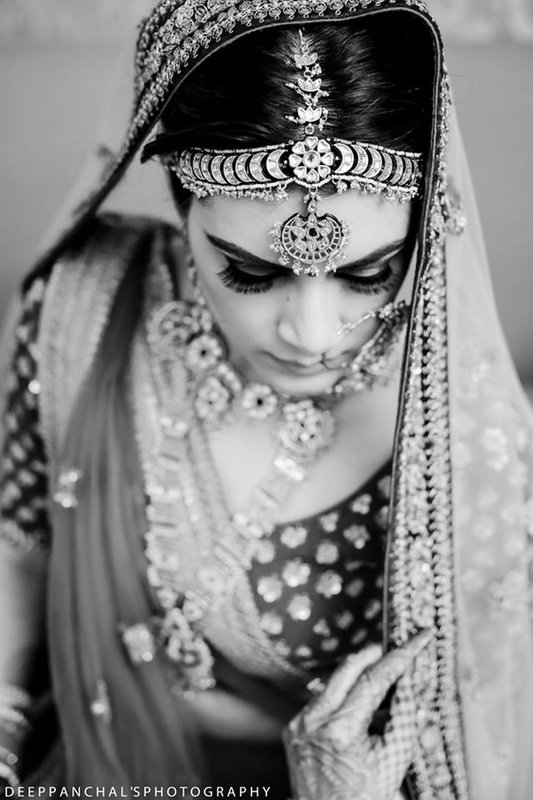 Bride and all things bridal. 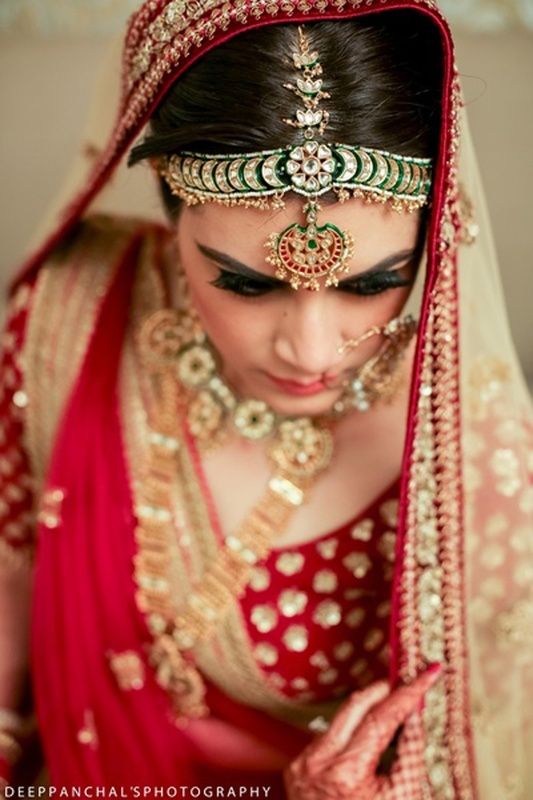 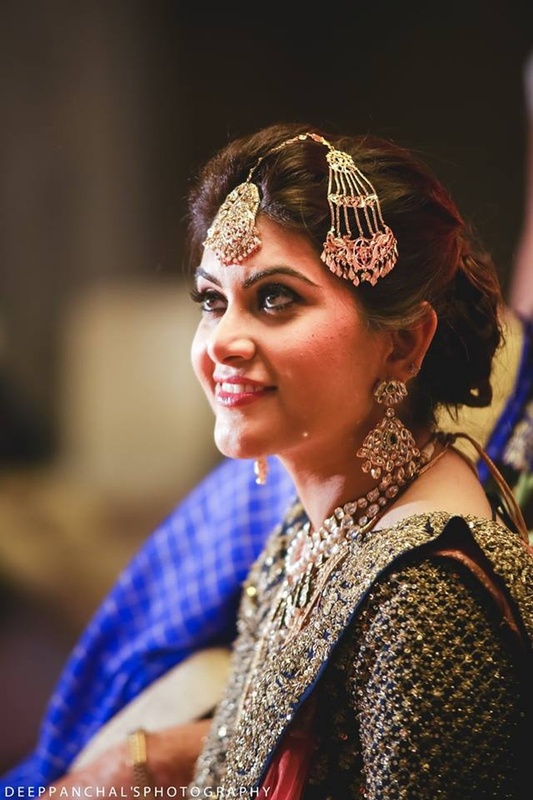 Bride adorned in beautiful gold and meenakari jewellery for the wedding day. 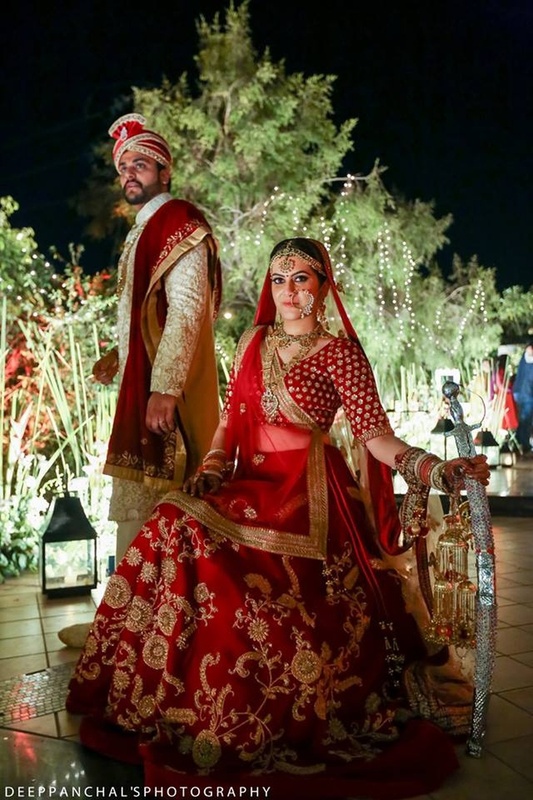 Wearing regal red and gold lehenga paired with beige dupatta and styled with beautiful gold and meenakari jewellery for the wedding day. 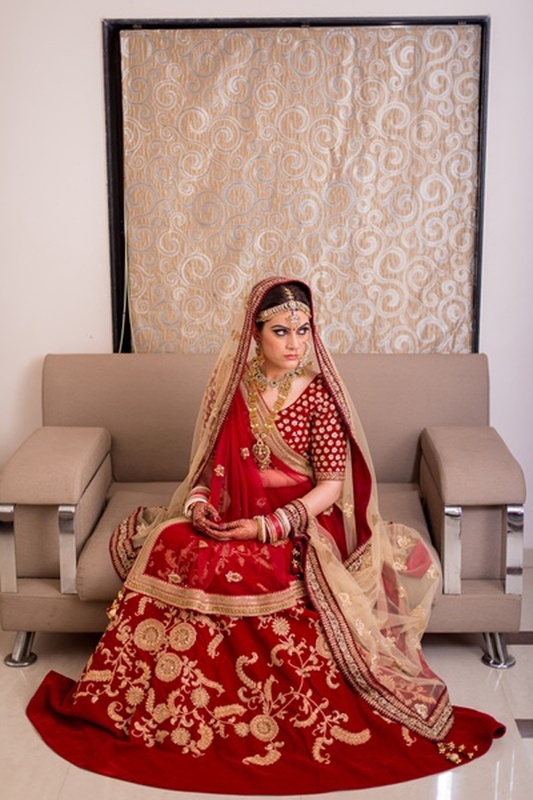 Wearing polki matha patti for the wedding ceremony. 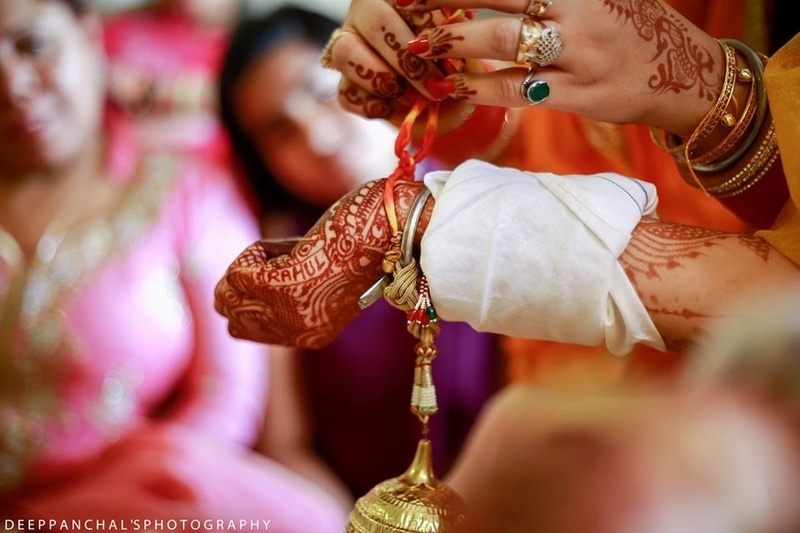 Varmala ceremony held at Baghban party plot, Ahmedabad. 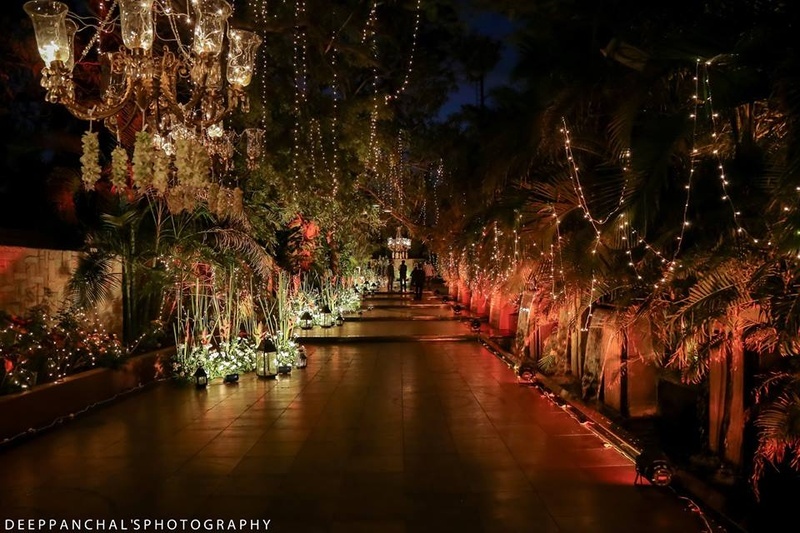 Wedding entrance beautifully decorated with fairy lights! 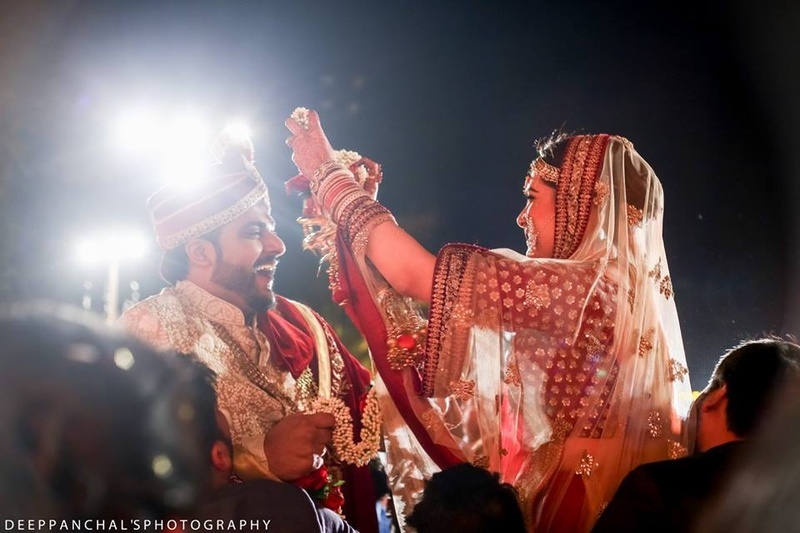 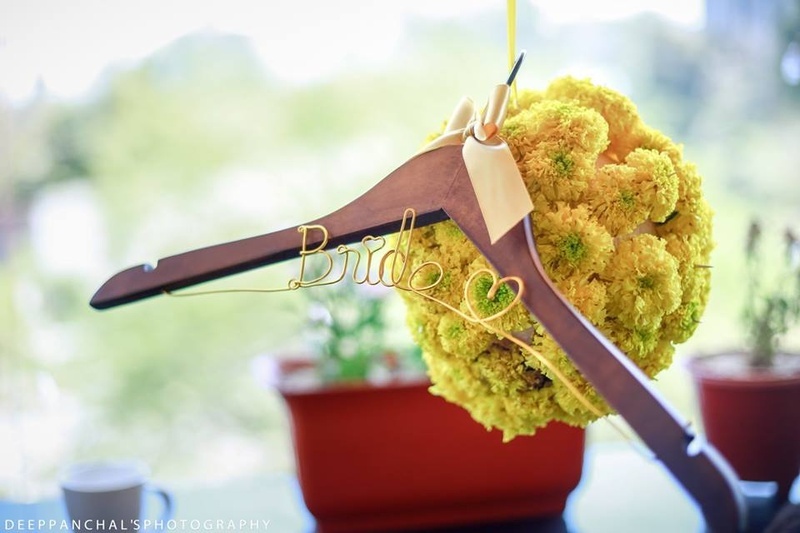 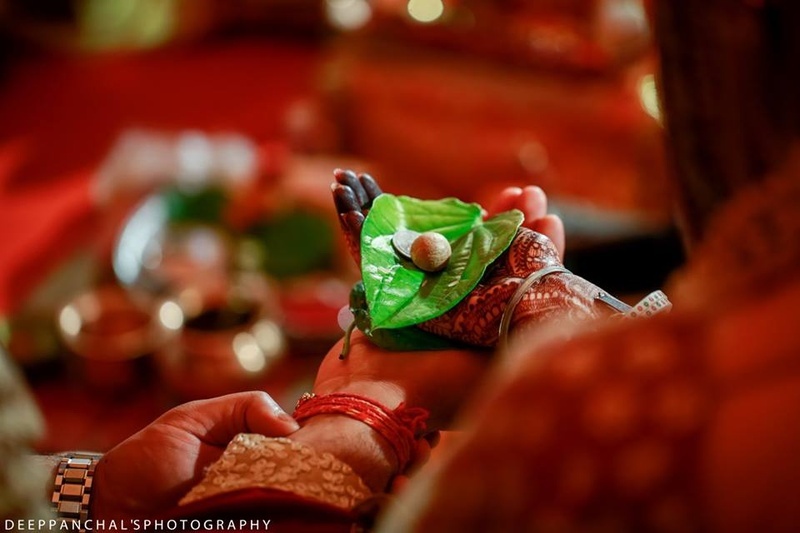 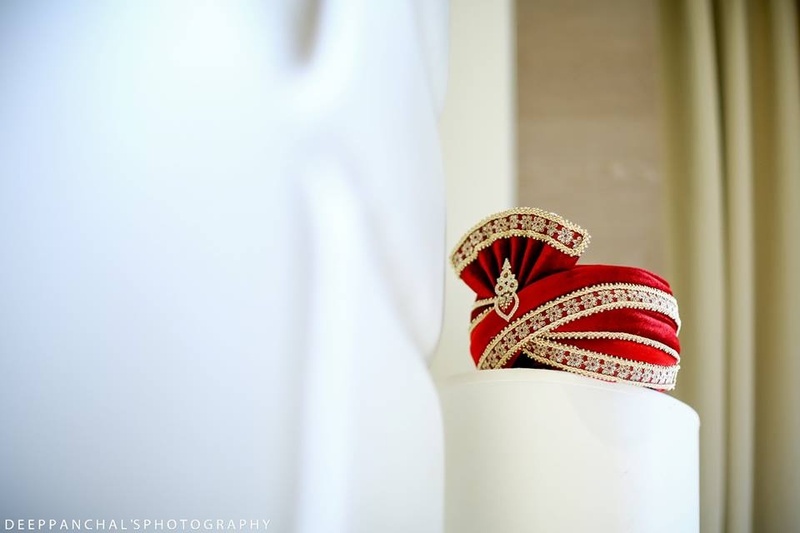 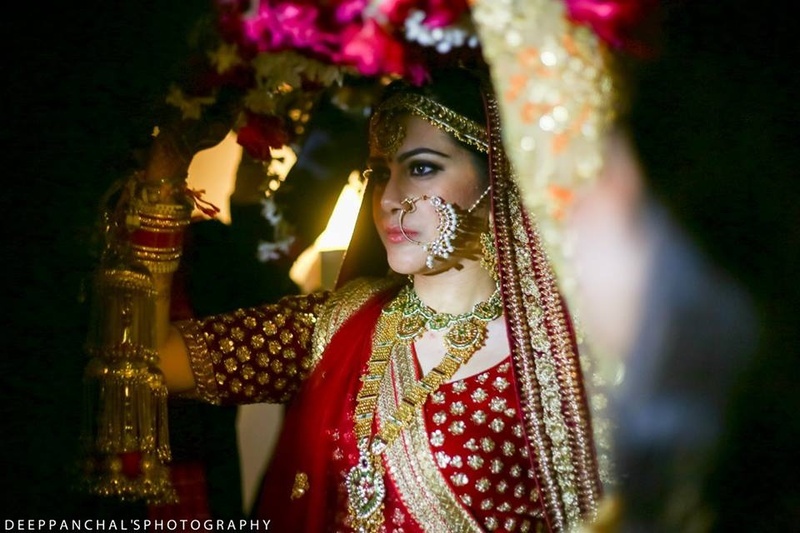 Wedding rituals captured by Deep Panchal's Photography.